How do the millions of people you never meet in the city put you at greater risk of psychosis? And does the built environment shape the social structure of the city in ways that impinge on illness? 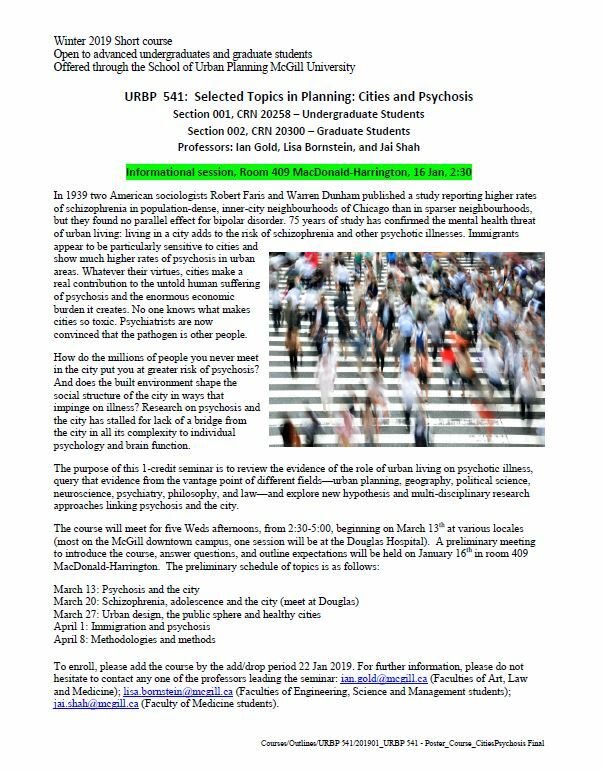 The purpose of this 1-credit seminar is to review the evidence of the role of urban living on psychotic illness, query that evidence from the vantage point of different fields—urban planning, geography, political science, neuroscience, psychiatry, philosophy, and law—and explore new hypothesis and multi-disciplinary research approaches linking psychosis and the city. To enroll, please add the course by the add/drop period 22 Jan 2019. For further information, please do not hesitate to contact any one of the professors leading the seminar: ian.gold [at] mcgill.ca (Faculties of Art, Law and Medicine); jai.shah [at] mcgill.ca (Faculty of Medicine students).